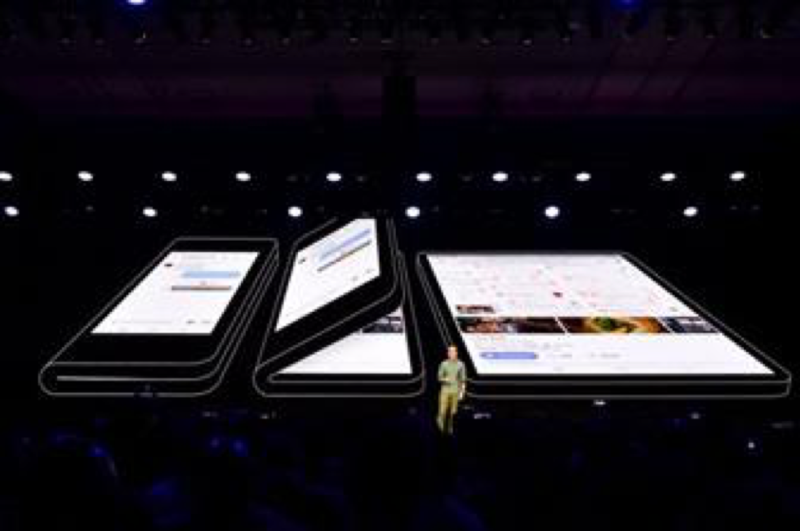 Samsung Electronics Co departed from its usual policy of keeping product plans highly secret and provided details of its new foldable phone’s key features for app developers last week. Is this change in policy a function of the recent release of Royole’s FlexPai? Of course it is!Information sharing Korean edition of The Bell reported on Samsung folding smartphone with an OLED display. ​The first such smartphone Samsung will have a 7.29-inch foldable display with 1528x2162 (479 ppi) resolution (420 ppi), and auxiliary 4.58-inch screen with 840x1960 resolution (420 ppi), In the unfolded state, the device turns into a small tablet with a 7.3-inch screen. In the folded state, the small display diagonal of 4.58 inches. Samsung Display has already begun production of foldable displays and initial volume has reached 100 thousand units/month. Samsung may be releasing half a million to a million of these smartphones before the end of the year to study the response in the market. The S10 will feature a bezel-less design, in-display fingerprint reader, a triple rear camera and support for 5G networks. However, some recent reports claim the in-display fingerprint reader will not be ready. Samsung replaces the traditional glass with a flexible “advanced composite polymer.” The material is colorless polyimide from Sumitomo. There’s also a 45% thinner polarizer. In terms of the software, Samsung has confirmed previous reports that it is working directly with Google to ensure that Android handles this sort of form factor appropriately. Google announced support for foldables at the Android Dev Summit and says that this support will be available in “future Android releases” as well as being in Samsung’s foldable devices. Samsung’s new One UI will be running on this new hardware. The company says that it will support using up to 3 apps concurrently in multi-windows on the larger display. The outer “cover” display is a 4.58-inch OLED panel with a resolution of 840×1960. The inner display is a 1536×2152 OLED panel at 7.3-inches.